I listen to huge amounts of melodic death and progressive metal. Nu metal isn’t a genre I follow closely. When a good song happens along, however, it sticks. 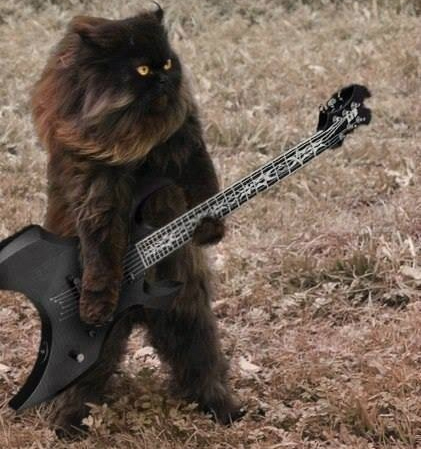 Dark Metal Cat also doesn’t follow nu metal closely. He does, however, follow a huge number of mice and geckos. Don’t dare tell him he can’t follow a tune. He has very, very big, sharp claws. I see I royally screwed up yesterday. I posted my #8 and #7 for 1995, not 1994. I’ll edit that post to show the correct year. Here are the songs I should have used for 1994. 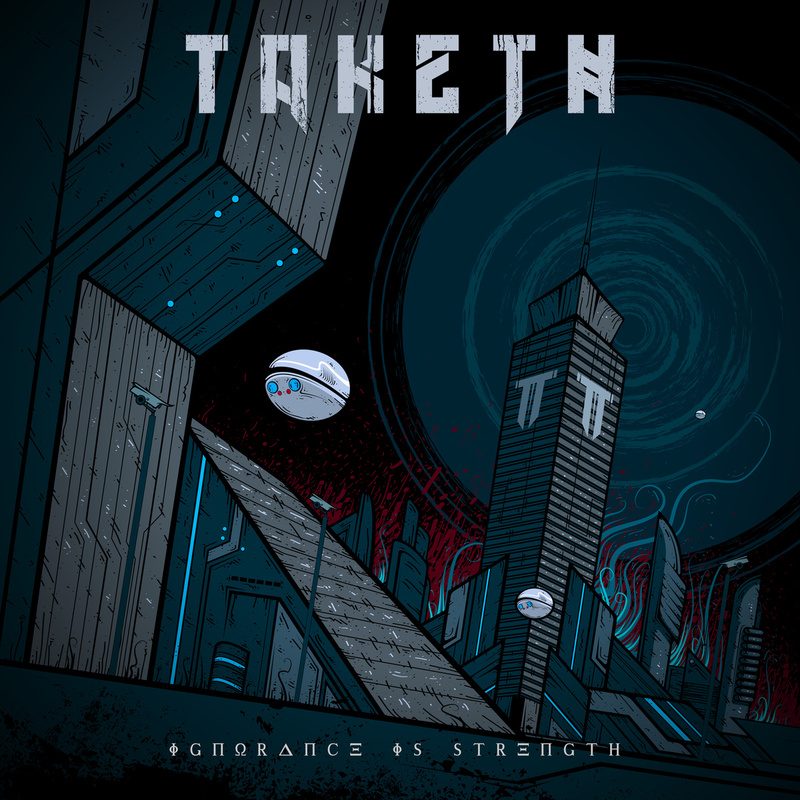 Taketh is a Swedish melodic death metal band and this is their second full length album. It contains ten tracks of typical sounding melo death, with growling vocals, melodic choruses and middle paced songs. The songs are well written and well performed and although the lyrics are a bit simple and too cliché, it still works out okay. After a couple of listens it gets a bit repetitive, both the music and the vocals don’t have much variation to them and some riffs seem a bit overused. I like the guitar solos and the more screamy, powerful vocals that appear at times. More of that and a little more diversity and maybe it could have been a more than average release. The last song is titled “Mind Numbing Crap” and makes me suspect the band isn’t overly serious about this release and when I hear it ends with someone saying “Oh well, shut up” in Swedish, I smile to myself and think my suspicions were probably right. But I hope Taketh are having fun when creating music, which is all that matters in the end! This is still one of the best melodic death albums in the genre’s history. Relentless, heavy and guitar-oriented. At The Gates was a band that made melodic death metal what it is today. Too bad they broke up after this release. It was the unique cover art and the band name that drew my attention to this record. For a fan of Dark Tranquillity and old In Flames, like me, this was a really nice find! Elysian created a fine and diverse melodic death metal album that I think metalfans of any genre can appreciate. It’s aggressive music with a melancholic mood, with bits of traditional heavy metal, thrash and some proggy influences at times. Slipknot was the first band to be announced as a headliner for the Sonisphere festival UK. I was pretty much sold on that day right off the bat since I have yet to see Slipknot live. I hear its a spectacular show. Then another headliner was announced in the form of Biffy Clyro. I scratched my head on that one, but I have to remember that festivals are supposed to have a little of everything for everyone. I guess I can’t complain with that because it made my decision to see Slipknot even easier. Then there was the big news…Sonisphere promoters signed up the Big Four for their first ever Big Four UK appearance. Sorry Slipknot, I will be buying a different day pass for my participation in this year’s Sonisphere UK weekend. Mastodon – Seen them once; this band made my list of bands I think I should like, but do not…and I still don’t know why. So there you have the latest for Sonisphere. There are probably 90+ bands yet to be announced. Are you going to go? Which day? Hello. Thanks for tuning in again. Before I post the SOTD for today, I just wanted to take a second to thank each of you for supporting A Metal State of Mind (and by supporting us, I mean stopping in and reading our blog). We may not have the highest totals on the web, but I know our subject matter is solid and timeless. I sincerely hope you will continue to follow us in the new year. I am a huge fan of In Flames. These guys are pioneers of melodic death metal, and they have a very unique sound. Although their founding guitarist left the band earlier this year, I am confident their new album will be great (scheduled for a 2011 release).